This tutorial was submitted to my Live Journal community Sew Underground a few years back. It's an oldie but a goodie. It's very easy to do and makes a really cute shirt. Enjoy! -Five (5) panels of Mummy fabric for the torso. ~Three (3) narrow panels for the front. -Two (2) smaller panels of Mummy fabric for the sleeves. -Bias Hem Tape for the neckline. -Black ribbon, or in a matching color for the back tie. -Long rectangular piece of T-shirt material in a matching color for the waistband. ~Throughout this project I tried on the shirt to make sure it looked just right. 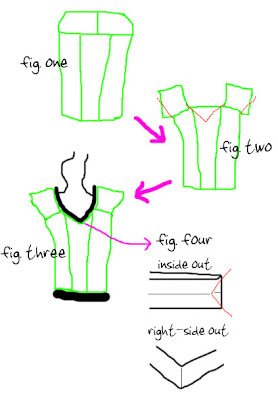 ~Sew together the 3 narrow pieces together to form the front of the shirt. ~Sew together the 2 wide pieces together to form the back of the shirt. ~Sew the front and back together to form a tube top. Step 2: Add sleeves Try on the tube top to find the right places to add the sleeves!! ~Cut off excess from the dart to arm pit. ~Cut out V-shape from one sleeve to the center to the other sleeve. ~Repeat to the back of the shirt. -Then add ribbons to the hem tape on the back!! !